This CKL issue is mainly focused on Volvo vehicles. Our very own expert, Martin Pink, will be taking you through picking and decoding a typical NE66 lock in detail. You will then be taken through how to decode and cut a NE66 4 track key using the brand new Condor Mini electronic cut to code machine - which is an extremely simple and precise process from beginning to end, even for a beginner! 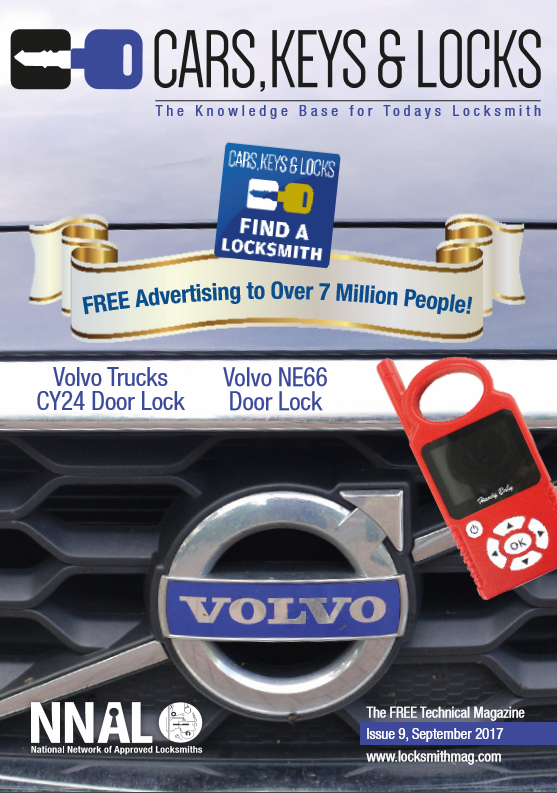 He will then guide you through picking and decoding a CY24 Volvo truck door lock, which is a process some users find tricky. He will also show you how to find the full cuts for the key using Instacode. Finally, we have produced a fantastic step-by-step guide on the Handy Baby Transponder Cloner - showing you just how easy it us to use by cloning a Ford ID63 4D key using a low cost and reliable JMD 4D cloning chip. 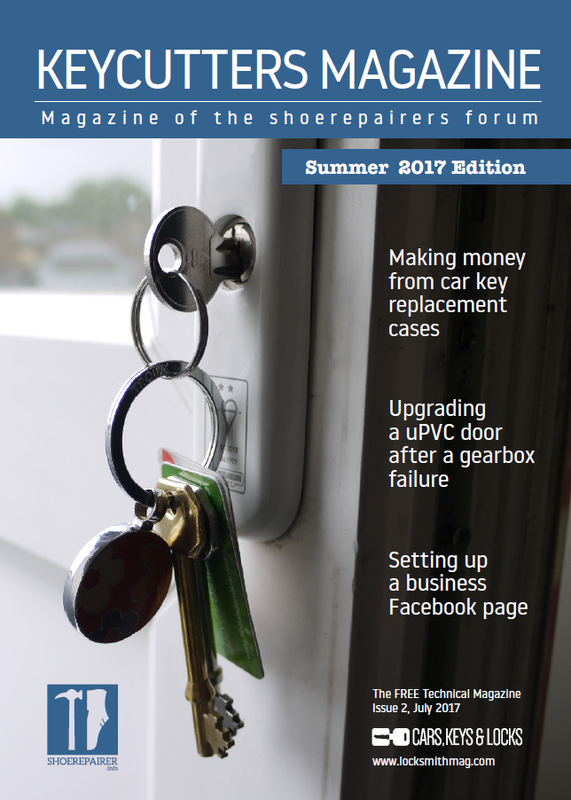 Welcome to the Summer edition of Key Cutters Magazine. Recently we have seen more competition from supermarkets & national hardware chains trying to diversify their ranges by adding key cutting as an additional service. Many people underestimate the skill & expertise that goes in to every service provided. These skills are something that is not learnt overnight, and cannot be trusted to complete novices to run. There is now a need more than ever to diversify the products and services you supply in order to stay ahead of competition and keep your profits healthy. It features articles from TradeLocks, CitySafe and Martin Pink. If you haven’t already subscribed, you can subscribe below to get the magazine sent to you for free! In this issue Martin Pink will be taking you through the NSN14 Lock, commonly found on this model. 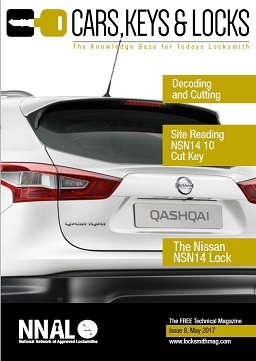 Everything from picking the lock on the 2013 Nissan Qashqai, using a Genuine Lishi 3in1 pick/ decoder, to decoding the lock with the help of Instacode or the Genuine Lishi direct reader. Martin will also be taking you through a step by step process of decoding and cutting an edge key for the lock using the incredible and highly sought after Keyline Ninja Laser. He will guide you through sight reading the lock and tell you everything you need to know about the illusive 11th cut found on some NSN14 keys. The final Nissan guide this month is a programming guide using one of favourite systems - Truecode!